Here is a good look at the variation between male and female Spot-crowned Barbets! These birds can be found in Panama and Columbia in low to mid-elevation forests feeding on fruits and insects. Aso, a clay-coloured thrush present on this video. 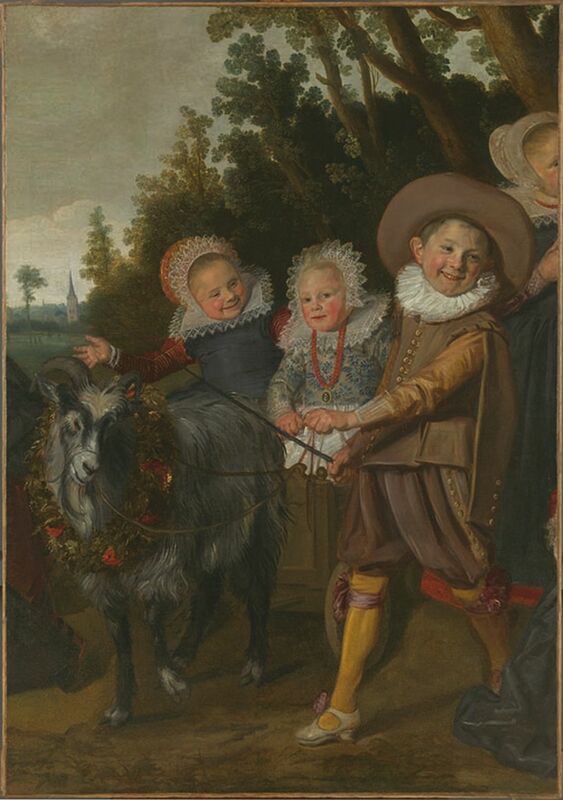 This painting is by Frans Hals (Dutch, 1582/83–1666); Children of the Van Campen Family with a Goat-Cart (fragment), ca. 1623–25, oil on canvas. 152 x 107.5 cm. Royal Museums of Fine Arts of Belgium, Brussels, inv. 4732. 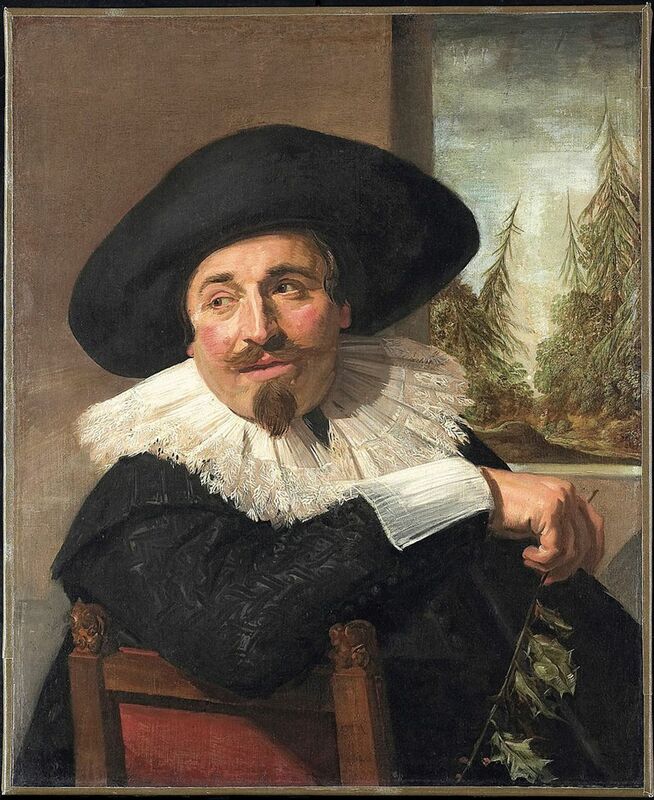 The Toledo [Ohio] Museum of Art recently presented an exhibition featuring works by one of the leading Dutch painters of the 17th century—Frans Hals Portraits: A Family Reunion. The Dutch “Golden Age” produced a host of extraordinary artistic figures, including most prominently Rembrandt van Rijn (1606–69), Hals (c. 1582–1666) and Johannes Vermeer (1632–1675). Other brilliant painters, of everyday life, domestic and tavern scenes, of landscapes and seascapes, of still lifes and historical events, included Jan van Goyen (1596–1656), Salomon van Ruysdael (c. 1602–1670), Judith Leyster (c. 1609–1660), Adriaen van Ostade (1610–1685), Gerrit Dou (1613–1675), Gerard ter Borch (1617–1681), Jan Steen (c. 1626–1679), Jacob van Ruisdael (c. 1629–1682), Pieter de Hooch (1629–1684) and Nicolaes Maes (1634–1693). The Hals exhibition will next run at the Royal Museums of Fine Arts of Belgium in Brussels from February 1 to May 19 and later at the Fondation Custodia, an art museum in Paris focusing on works by European old masters. The exhibition was prompted by the Toledo museum’s acquisition in 2011 of Hals’s The Van Campen Family Portrait in a Landscape (c. 1623–25), along with the recent conservation work done on the Brussels museum’s Three Children of the Van Campen Family. Remarkably, as the Toledo museum website explains, “These two works [by Hals] originally formed one composition, separated for unknown reasons likely in the late 18th century or early 19th century. The exhibition reunites the sections of the Toledo/Brussels painting along with a third fragment from a private collection.” In other words, this was the first time in some 200 years that three pieces of the original painting were present in the same location. The curators also offered a proposed reconstruction of Hals’s complete painting as it might have looked when it was painted nearly four centuries ago. 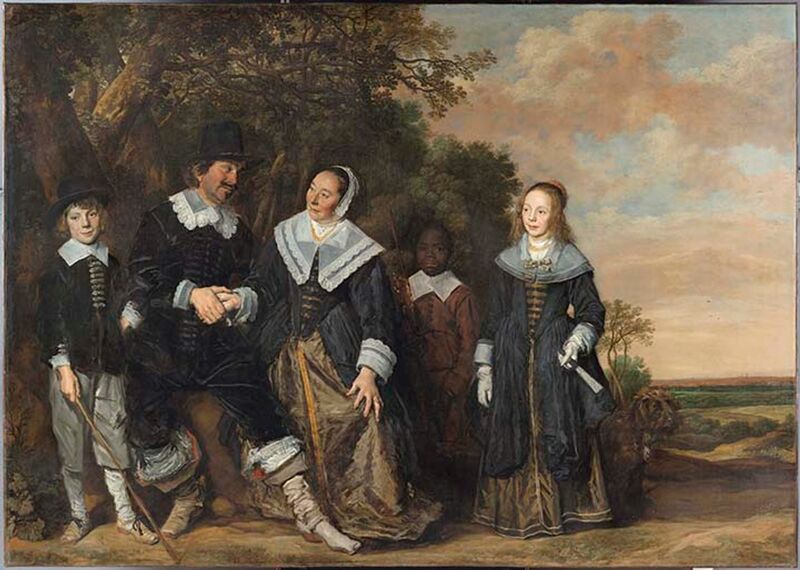 Additional works by Hals were featured in Toledo, including Family Group in a Landscape (c. 1645–48) from the Museo Thyssen-Bornemisza, Madrid; Family Group in a Landscape (c. 1647–50 ) from the National Gallery in London; Marriage Portrait of Isaac Massa and Beatrix van der Laen (c. 1622) from the Rijksmuseum, Amsterdam; and Portrait of a Dutch Family (mid-1630s) from the Cincinnati Art Museum. Also on display were Portrait of a Seated Man Holding a Hat and Portrait of a Seated Woman Holding a Fan (both c. 1650, from the Taft Museum of Art, Cincinnati, Ohio). A good portion of the catalogue published to accompany the exhibition is devoted to explaining the facts of the Van Campen family painting and proving that the three pieces belong together (along with other still unknown ones). The case seems convincing, but that is a matter for art historians and experts to debate and determine. The Toledo exhibition was not large, nine paintings by Hals (including the three separate fragments), but the work was all beautiful. 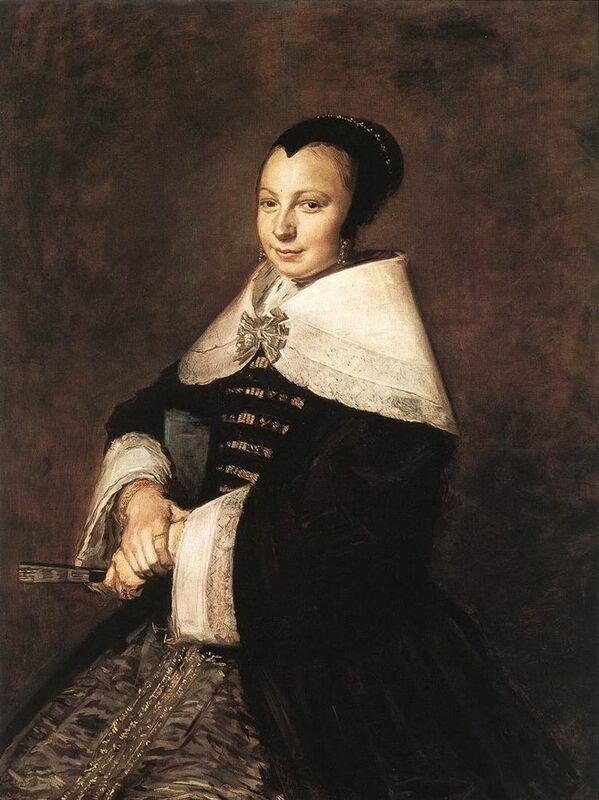 Frans Hals was born in 1582 or 1583 to Adriana and Franchoys Hals in Antwerp, then in the Spanish Netherlands. Starting in the 1560s, the “Seventeen Provinces,” including present-day Netherlands and Belgium, had risen in revolt against the rule of Philip II of Spain, the Habsburg monarch. The struggle lasted for some 80 years. The Dutch uprising was bound up with the transition from feudalism to capitalism. Antwerp became the capital of the Dutch revolt. However, the Spanish forces counter-attacked and their troops, under the Duke of Parma, laid siege to Antwerp in July 1584. The city surrendered in August 1585 to the Spanish, who gave the Protestant population four years to settle their affairs before leaving. Hals married twice. He had three children with his first wife, Anneke Harmendr, only one of whom survived early childhood. Anneke died in 1615, and two years later Hals married Lysbeth Reyniersdr, who bore 11 children (four of whom became painters). The painter’s naturalistic work fell largely from favor in the 18th century, as a tendency even in Holland toward more aristocratic and classicistic academicism took shape, and was only “rediscovered” in the second half of the 19th. Hals came to specialize in portraiture. The Toledo exhibition had several magnificent examples. Seated Man Holding a Hat and Seated Woman Holding a Fan (the subjects’ names are unknown) are assumed to be a newly married couple. Hals scholar Seymour Slive describes the pictures as among “Hals’s most sympathetic portraits of a husband and wife.” She in particular makes an impression, gazing at the viewer confidently. 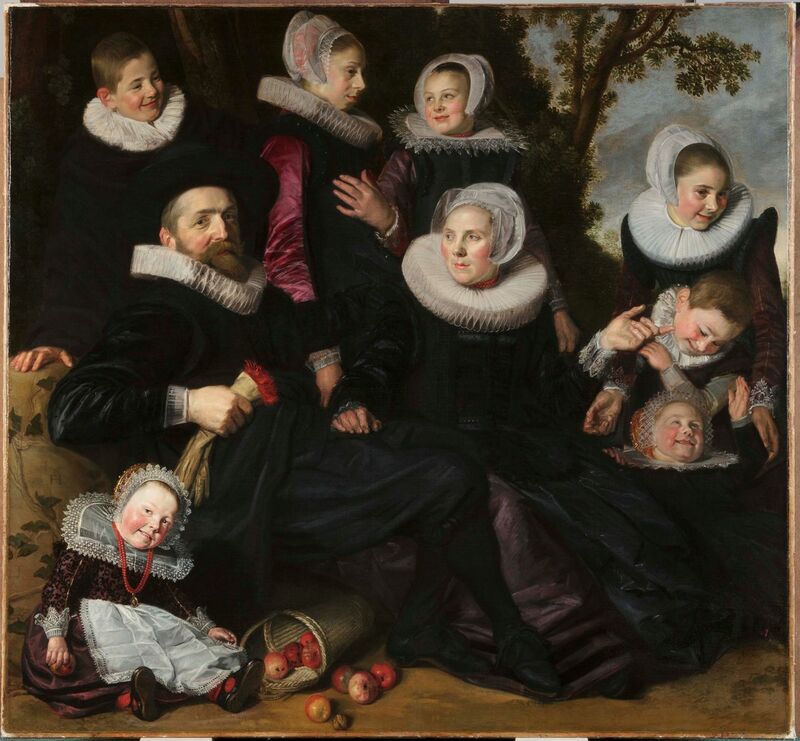 In Hals’s first family group portrait, the work at the center of the Toledo-Brussels-Paris exhibitions, The Van Campen Family in a Landscape, the painter continued—Nichols asserts—“to visually communicate a sense of immediacy … Moreover, he confronted the pressing challenge incumbent on a painter of group portraits of any category: how to capture individuality as well as the collective dynamic of the group and each individual’s relationship to it.” Van Campen, a cloth merchant, his wife and seven children are represented in one of three fragments; a second, narrower picture shows four children; and a third includes the head and torso of a boy (apparently another Van Campen son). 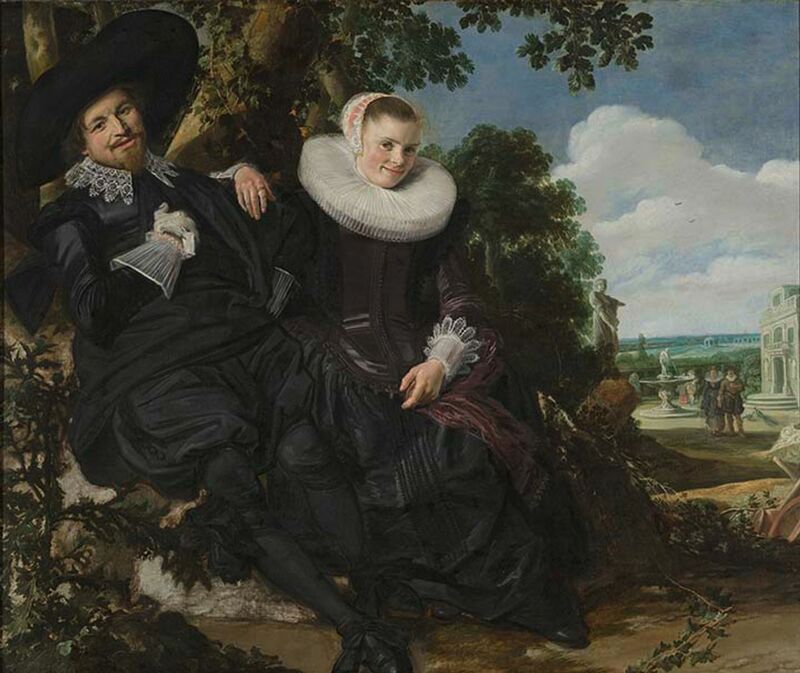 A painting that deserves its own essay is Marriage Portrait of Isaac Massa and Beatrix van der Laen, described as “an unmitigated standout in the collection of the Rijksmuseum in Amsterdam.” Mariët Westermann (A Worldly Art—The Dutch Republic 1585–1718) argues that there “are no direct Dutch precedents” for this double portrait. We know something about Massa, born into a wealthy silk merchant’s family and sent to Moscow at 15 to assist the family trade, including the fact that Hals painted him several times. Massa also served as a witness at the baptism of one of Hals’s daughters. They presumably were friends. The same, of course, could be said about Hals himself. Every opportunity should be taken to see the work of Hals and the other Dutch painters. Chasmaporthetes, also known as hunting or running hyena, is an extinct genus of hyenas distributed in Eurasia, North America, and Africa. It lived during the Pliocene-Pleistocene epochs, from 4.9 million to 780,000 years ago, existing for about 4.12 million years. The genus probably arose from Eurasian Miocene hyenas such as Thalassictis or Lycyaena, with C. borissiaki being the oldest known representative. It was a fast runner and an important carnivore on 4 continents during the Pliocene. At least nine species are currently recognised. The genus type species is Chasmaporthetes ossifragus. 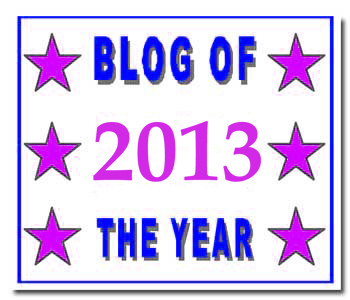 It was assigned to Hyaenidae by Hay (1921), Geraads (1997), and Flynn (1998). The species C. ossifragus was the only hyena to cross the Bering land bridge into the Americas. C. ossifragus ranged over what is now Arizona and Mexico during Blancan and early Irvingtonian Land Mammal ages, between 5.0 and 1.5 million years ago. Chasmaporthetes was one of the so-called “dog-like” hyenas (of which the aardwolf is the only survivor), a hyaenid group which, in contrast to the now more common “bone-crushing” hyenas, evolved into slender-limbed, cursorial hunters like modern canids. The genus has entered the popular culture lexicon as a result of cryptozoologic claims, having been proposed as the likely origin of the American Shunka Warakin and the Cuitlamiztli. Chasmaporthetes was named by Hay (1921), who noted the name to be a reference to the possibility that the beginning of the Grand Canyon was witnessed by the North American species, C. ossifragus. The limb bones of Chasmaporthetes were long and slender like those of cheetahs, and its cheek teeth were slender and sharp-edged like those of a cat. Chasmaporthetes likely inhabited open ground and was a daytime hunter. In Europe, the species C. lunensis competed with the giant cheetah Acinonyx pardinensis, and may have preyed on the small bourbon gazelle (Gazella borbonica) and the chamois antelope (Procamptoceras brivatense). The North American C. ossifragus was similar in build to C. lunensis, but had slightly more robust jaws and teeth. It may have preyed on the giant marmot Paenemarmota, and competed with the far more numerous Borophagus diversidens. A study on the genus’ premolar intercuspid notches indicated Chasmaporthetes was likely hypercarnivorous rather than durophagous as its modern cousins (excluding the aardwolf) are. Like most of the animals of the time, reasons for its extinction are not known. 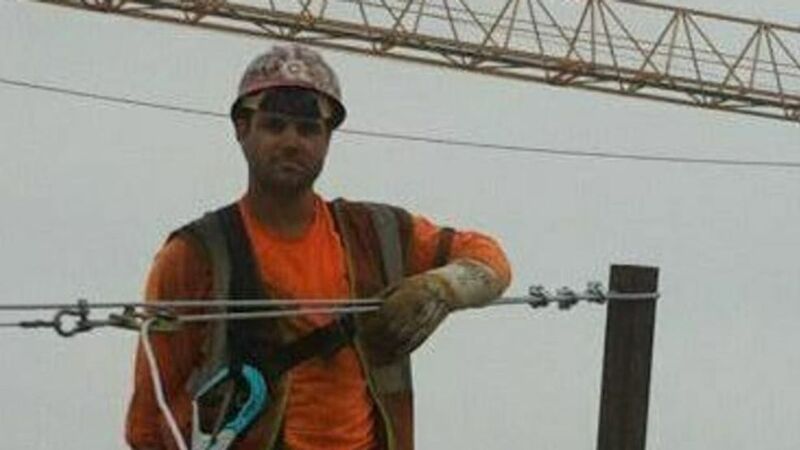 Ironworker Brien Daunt was killed Saturday at the construction site of a new Amazon fulfillment center near Bakersfield, California. According to local news reports, the 45-year-old father leaves behind one daughter. The information available regarding the circumstances of Daunt’s death is limited. It was reported that he fell from a structure just before 3:00 in the afternoon. He was a member of Ironworkers Local 433. The Division of Occupational Safety and Health has opened an investigation, which could take up to six months. The state agency’s press release stated that it “has opened an inspection to determine the cause of the incident and correct workplace safety hazards.” Amazon has not made any official statement, and the incident has not been reported outside of local news. According to Bakersfield Now, Amazon has been “gobbling up Bakersfield real estate.” The fulfillment center under construction, when completed, will be a total of 2 million square feet and is expected to employ as many as 1,500 workers. Bakersfield, located in the flat central valley north of Los Angeles, is an impoverished city of 380,000 with a local economy dominated by agriculture, livestock, and oil fields. In 2016, the percentage of residents with income below the poverty level was 26.7 percent, compared to 19.1 percent statewide. The disability rate among poor males was 26 percent, compared with 16.2 percent statewide; for females, 24.5 percent compared with 18.6 percent statewide. The percentage of children below the poverty level was 26.4 percent, compared with 19.6 percent statewide. The city ranks among the worst in the country for air quality, and it has been afflicted by successive waves of opioid and methamphetamine addiction and overdoses. Amazon scours the world for vulnerable communities like Bakersfield, where it believes it can maximize the exploitation of the local workforce. In return for “creating” jobs in an economically devastated area, Amazon frequently demands immunity from regulations, free money in the form of tax exemptions, and other giveaways from local governments. The jobs in Amazon’s fulfillment centers are notorious for their low wages and tyrannical working conditions. Workers are forbidden from talking, mobile phones are prohibited, and every second of a worker’s time is monitored to increase productivity. Amazon was featured last year in an annual report by the National Council for Occupational Health and Safety (COSH): “The Dirty Dozen 2018: Employers Who Put Workers and Communities at Risk”. At the time of that report, seven workers had been killed at Amazon warehouses in the US since 2013, including three workers in a five-week span during the high-volume holiday “peak season” in the fall of 2017. In September of last year, Amazon worker Mike Gellasch, 61, died of cardiac arrest at a fulfillment center in Murfreesboro, Tennessee. His death was the subject of an investigation by the local WSMV News-4 station, which revealed that company radios were not working, five minutes passed before emergency responders were called, and the 911 operator was inexplicably put on hold. A Murfreesboro worker interviewed by the International Amazon Workers Voice after the incident questioned the company’s refusal to allow workers to carry mobile phones. Two more Amazon workers were killed in November when a wall collapsed in Baltimore during a storm. More than 5,000 deaths occur annually in the workplace in the US, in addition to 95,000 workers who die every year from various forms of workplace poisoning: cancers, respiratory and circulatory diseases and other illnesses associated with toxic working environments. Millions more are injured, maimed, or disabled at the workplace. A newborn baby was found dead at an Amazon distribution center in Phoenix.